In Israel, archaeologist Grace Madison shoots her daughter’s abductor. Seconds later, a handsome shepherd drops from the sky to kill a second assassin. Their world crumbles in two blinks of an eye. Unbeknownst to them, a fierce evil is destroying everything in its path—the unconventional path Grace and Maggie, a hydrologist, take as they struggle to right a wrong as old as time. But they soon discover time is running out. A vortex of intrigue and espionage threatens to sweep away everything and everyone they hold dear, extinguishing old flames even as it ignites new loves. When the scale tips precariously toward disaster in the Middle East and beyond, family and friends with secrets of their own are exposed and millions of lives hang in the balance. Mother and daughter realize nothing is as it seems. Contemporary suspense with a thread of romance, written from the crossroads of faith and espionage. After an award-winning detour through journalism and marketing, then a graduate degree from Dallas Theological Seminary, NLB Horton returned to writing fiction. She has surveyed Israeli archaeological digs accompanied by heavy artillery rounds from Syria and machine gun fire from Lebanon. Explored Machu Picchu after training with an Incan shaman. Cruised the Amazon and its tributaries. And consumed afternoon tea across five continents. NLB, a mother of two adult children, lives atop a Rocky Mountain with her husband of almost thirty years, an ancient tabby cat, and whatever wildlife wanders through the back meadow. She’s passionate about her faith, archaeology, women’s issues, and the environment. She’s also a world-class angler, a competent wing-shooter, and a dirt-encrusted gardener once the snow melts. She writes contemporary suspense with a thread of romance, from the crossroads of faith and espionage. 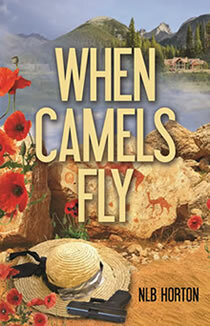 When Camels Fly, her first novel, is available on Amazon, Barnes & Noble, for iBook, and through independent booksellers. The second, The Brothers’ Keepers, will be available November 17, 2014. 1. What is your favorite scene in the book? Why? Actually, I have two favourite scenes. The first introduces my protagonist, Grace Madison. She’s hiding behind a boulder in a desert wadi (dry canyon) near the Dead Sea in Israel. Petrified out of her wits because she’s been told her beloved daughter, Maggie, is about to be killed there. Readers experience Grace’s humanity and determination, her fierceness and intelligence. They suspect she’ll do whatever it takes to save this formidable young woman, although she’ll never escape the high price if she kills her daughter’s abductor. The predicament leaves Grace raw, but her love for Maggie trumps all. And Grace never loses her sense of humour. 2. What is in your To Read Pile that you are dying to start or upcoming release you can’t wait for? Silva, Silva, Silva! Daniel Silva’s The Heist is absolutely at the top of my list. I love everything he does, and I think he’s a master of his craft. His characterizations are superb, and he never disappoints. Reading Silva makes me a better writer. What more could I ask? I’m also looking forward to Laurie R. King’s Dreaming Spies. Her depiction of the relationship between Sherlock Holmes and Mary Russell is so original, and she’s a fine storyteller. Her books are joys to read. And actually, through the end of the year, I have a book a month on order: Baldacci, Charles Todd, Steve Berry, etc. 3. How do you spend your free time? Do you have a favorite place to go and unwind? I … fly fish. Actually, I am a maniacal, devoted, experienced fly fisherman. I owned a small ranch for years, and a river ran through it. (That might make a great title for a novel.) I taught my children to fish when they were eight and five, and it’s a family hobby. I learned that young people will tell you anything while standing in a river, wearing waders, and I think our time doing just that built the amazing relationships we share to this day. (The kids are twenty-six and twenty-three now.) The sport is cathartic, requires total focus, and refreshes me to a degree that nothing else matches. 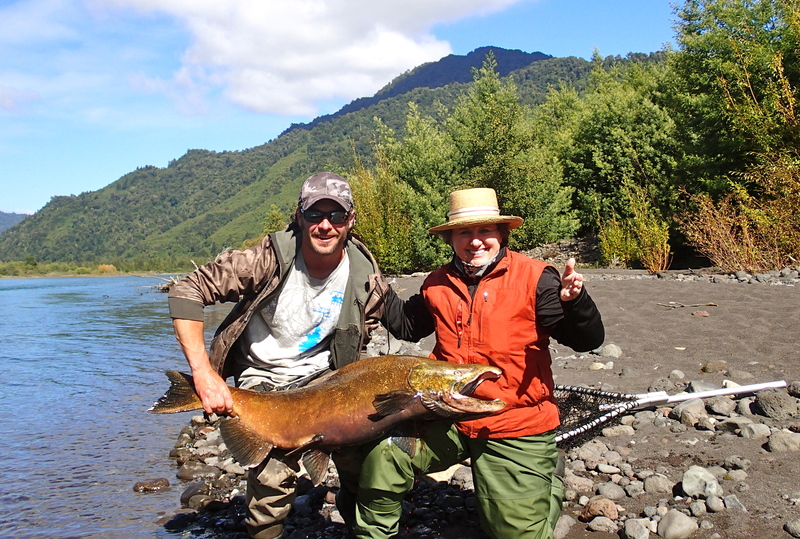 The photo is of a sixty-pound male salmon I caught in Chile last year, so I really do catch fish, although I’m as content to stand in the boat and practice casting. 4. Tell us three fun facts about yourself. I qualified for the International Game Fish Association (IGFA) World Championship Tournament. I love riding camels, though I cannot keep my backside on a horse. 5. 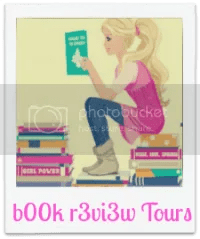 What do you have in store next for your readers? The Brothers’ Keepers will release in November; we’re doing cover design now. It’s a romp through Western Europe that begins about eighteen months after the ending of When Camels Fly. The story contains a bit more romance, a lot of adventure, humour, beautiful settings — all enhanced by German Reformer Martin Luther. How’s that for an enticing teaser? I’m writing the third manuscript in the series now. I plan to finish it during the first quarter of 2015, and release it that summer. 6. Is there anything else you’d like to share with your readers? First, thank you for the opportunity to share Grace Madison with your readers, some of whom I hope join Grace’s madcap journeys. These tales are a joy to me, and my intention is that Grace and her family, and the elderly archaeologists who accompany them, encourage and inspire. The functioning relationships, and escapades into which they’re thrown, depict people committed to doing the right thing while maintaining their independence, and love for each other.